Ken Egnaczak sat on a wall by the small backyard dam that he is trying to get approval to repower. CHESHIRE — As the turbid currents of the Hoosic River tumble over his backyard dam, a century-old barrier of concrete and limestone, Ken Egnaczak sees a cascade of lost opportunity. Day after day, the water flows by without generating even a spark. “It’s such a waste,” he said. 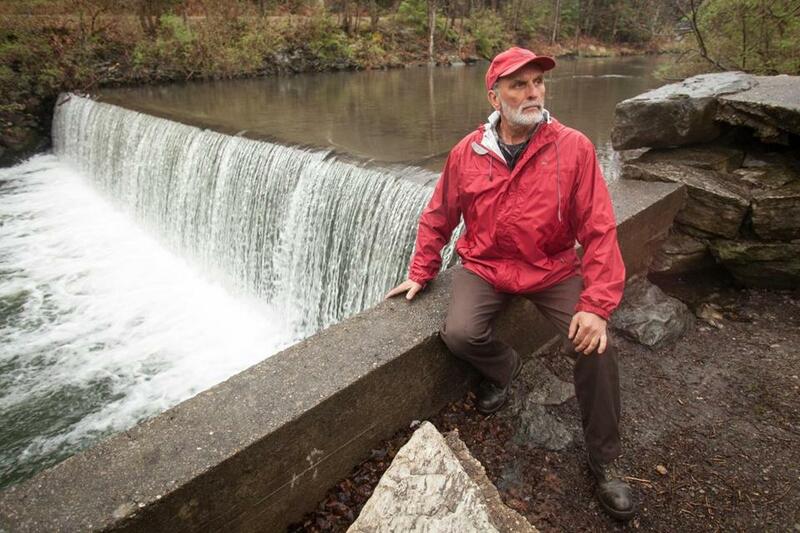 As the state seeks new sources of clean energy to replace power lost from the closures of nuclear and oil-fired plants, the retired mechanical engineer sees promise in the unharnessed power on his property, and at the nearly 3,000 other unused dams across the state. It’s an idea that’s gaining traction from the Berkshires to Beacon Hill, where lawmakers are considering legislation that would allow the state to import a massive amount of hydropower from Canada. Yet it also raises fears among environmental advocates, many of whom assert that the state should remove more dams across the state’s 10,000 miles of rivers, not repower them. One bill under consideration would allow small hydropower projects, the type Egnaczak envisions for his backyard dam, to receive the kind of incentives that have spurred the development of solar, wind, and other renewable energy. The proposed legislation follows a report last year by the state Department of Public Utilities that backed “net metering” for small hydropower facilities, allowing them to connect to the electrical grid and offset their bills with the energy they produce. The interest in developing such projects in Massachusetts — only 2 percent of the state’s dams now produce electricity — comes as a bipartisan effort in Washington, D.C., is promoting hydropower. In Massachusetts, energy and environmental officials say they want to encourage the development of local hydropower, which now generates about 150 megawatts of power a year, enough for nearly 100,000 homes. Federal studies have estimated that the state could produce up to 67 more megawatts of hydropower, which typically produces power with fewer interruptions than solar or wind. “We are very much looking at small hydro as an opportunity,” said Matthew Beaton, the state’s secretary of energy and environmental affairs. While more clean power could help the state achieve its carbon emissions goals — the state is required by law to reduce emissions to 25 percent below 1990 levels by 2020 — Beaton and others cautioned that each project would have to show that it would have minimal impact on the environment. Many of the state’s dams were built more than a century ago as the primary source of electricity to run mills and factories. They were also installed to help control flooding, create reservoirs, and serve other purposes, such as recreation. But as the state’s industrial base eroded, their usefulness declined, and environmental groups decried their negative impact. For example, dams block fish from their habitats and spawning areas, reduce water quality, and increase the damage from runoff, causing toxic algae blooms. Caitlin Peale Sloan, a staff attorney at the Conservation Law Foundation in Boston, opposes legislative efforts that would protect dams that damage a river’s ecology. “A blanket incentive to increase the repowering of small dams wouldn’t allow us to make a case-specific determination,” she said. But demolishing dams is expensive, and only a few are removed every year. About 70 dams have been razed over the past decade, leaving 2,929 today, state officials say. Most will remain in place for years to come, and are so pervasive that hydropower proponents say it should be easier to repower them. 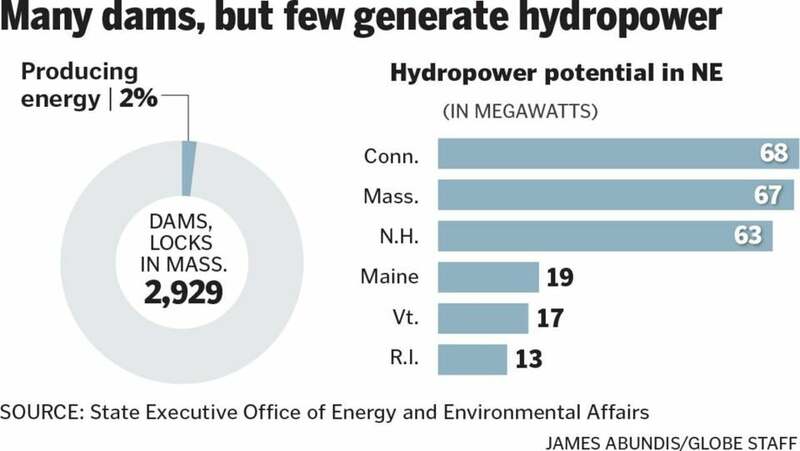 Michael Kerr, chief executive of the New England Hydropower Co., said the region’s changing climate should spur officials to connect more dams to the grid, and not only to reduce emissions. Over the past century, as the region’s temperatures have increased by 2 degrees Fahrenheit, the Northeast has experienced a 10 percent increase in precipitation, and climate models predict a significant rise in rain and snow in the coming decades. In the Berkshires, local officials two years ago surveyed the county’s rivers and deemed 62 of about 230 dams potential candidates for hydropower. Many smaller dams, like the one in Egnaczak’s backyard, weren’t included in their survey. The permitting process for hydropower is too “onerous,” he said, requiring more expense and time than most projects would return in energy and environmental benefits. Such regulatory challenges recently stymied an effort by West Stockbridge to seek just 9 kilowatts of energy from an old dam in the town center. Ken Egnaczak’s property in Cheshire is the site of a former mill and small backyard dam where the Hoosic River runs. Built in the 1800s for hydropower, the dam is now connected to a bridge and won’t be removed anytime soon, local officials said. The town let its federal license lapse years ago, but sought to renew the license after the state helped rebuild the dam in the 1990s and installed new electrical generators. Officials thought they could earn several thousand dollars a year by selling power to National Grid. Instead, they spent about $10,000 on consultants before giving up. 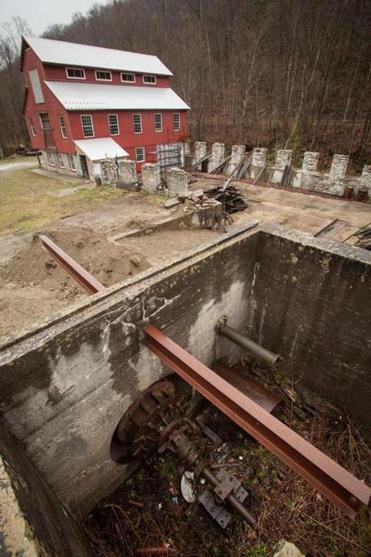 In nearby Cheshire, where the rusted remains of bygone turbines, pipes, and shafts litter his property along the Hoosic River, Ken Egnaczak insists he’ll persevere with his project, even if he cannot connect to the grid and can only use the power for himself. He has already spent much of the past decade restoring buildings where an old textile mill once stood and filing documents with a host of government agencies. The effort may never pay for itself, he acknowledged. But there are other reasons for his persistence.